The AIESEC Consortium 2012, organized by the LC, was designed to provide a means of interaction between 3 entrepreneurs of different industries and the students from Manipal’s professional colleges. The seminar commenced at dusk, with the President of the AIESEC LC, Vishal Kothari presenting an introductory speech, inviting interns from 3 countries, as well as all the present Manipal University students to the event. Followed by the lamp lighting ceremony, the first guest Mr. Anand Prakash, Head of RED FM, presented a Radio Workshop. Its purpose was to explain the inner structure as well as working of a FM station. He emphasized the advantages of FM in today’s world being its cost effectiveness, live interaction and usability while multitasking. He believes that the upcoming Phase 3 of the radio industry will link even the remote Tier III cities to radio, with an explosion in the industry to the advantage of sound engineers, technicians, programmers in the next five years. The second guest Mr. Harish Java, head of NABAD, based his presentation on the importance of the social entrepreneurship. Beginning his speech by stressing the use of SWOT analysis on ourselves for the purpose of matching our hobbies to our professions, he moved on to explaing the skill set required for being a social entrepreneur. Giving instances of NABAD micro financing SHGs in rural areas, he urged participants to think of the people at a disadvantage and move away from their comfort zones to make an impact. The highlight of the evening, as agreed by most, was the speech by Mr. Kumble Narsimha Prabhu, current CEO of Manipal ACE Event Management. Being an alumnus of Manipal University, he was able to relate to the students in a more direct and interactive way. His presentation involved, enlightening students on the challenges of entrepreneurship, such as it requiring a complete different mindset of someone who wants to achieve far more than just a salaried placement job. Citing the Tata saga as an example, he shared his views on the formula to success being character development, a positive attitude and the ability to recover from a setback failure. The evening, interspersed with refreshments, audience questions and fun activities organized by the LC of AIESEC. The event concluded on a 15 minute Panel Discussion on Ethical Morality in a Professional Career that ended the evening to a successful finish. Sub edited by: Deeksha Awasthi. The 2nd edition of the International Relations Conclave is to be held on the 6th and 7th April 2012. The conference aims to acquaint university students with the decisive and legislative bodies of the UN and offer a glimpse into the official decision-making process. The delegates will be expected to be well aware of their countries’ foreign policies and act in accordance, exhibit their diplomatic skills and engage in spirited, fruitful debate, in order to provide viable solutions to some of the most important global issues of the day. As they do so on behalf of the countries that they represent, their researching, negotiating and public speaking skills will be evaluated and put to the test. Also to be noted that this year, the conference shall be open to external participants as well, to put Manipal as the next go to destination on the MUN circuit. The brilliant, dedicated organizational staff, which has been working tirelessly over the last few months, will ensure smooth running of the conference at all times. Your participation, enthusiasm and creativity will be the key ingredients towards making this conference a success. The enthusiastic spirit and cultural diversity of Manipal, which is primarily a student town, coupled with the high quality of debate that has come to be associated with IRC, will provide you with an overall enriching and unforgettable experience.So, are you ready to put your best diplomatic self forward? International Relations Conclave (IRC) is also conducting a workshop on Tuesday, 3rd April. NLH 203, 5:30 p.m. onwards, for its delegates to acquaint them with the same. In one of the highlights of the academic year, and to flag off Revels 2012 in a grand manner, the extremely popular Indian fusion band KAILASA performed at the KMC Greens. This concert, which started at 7:30pm, saw a huge turnout from students all around Manipal. Almost everyone from this small university town flocked into the Greens to see famous singer and founder of Kailasa, Kailash Kher perform with his band. The crowd was subject to some brilliant music, coupled with fine light-works. This event was organized as a part of the “Pro-Show” event in Revels. Some of the highlight performances of the show included the songs ‘Allah ke Bande’, ‘Teri Deewani’, ‘Saiyaan’ and ‘Bam Lahiri’. The band also performed the famous song ‘Tu jaane na’ originally sung by Atif Aslam. 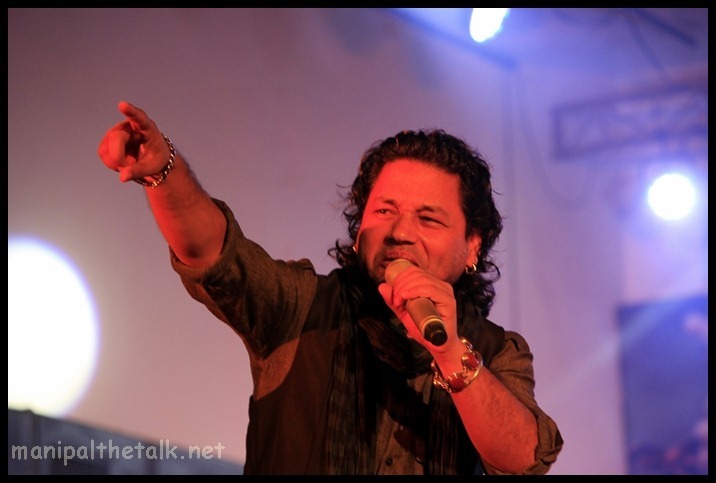 Kailasa’s performance was succeeded by performances by the bands ‘Wait For It’ and ‘Zehen’ . 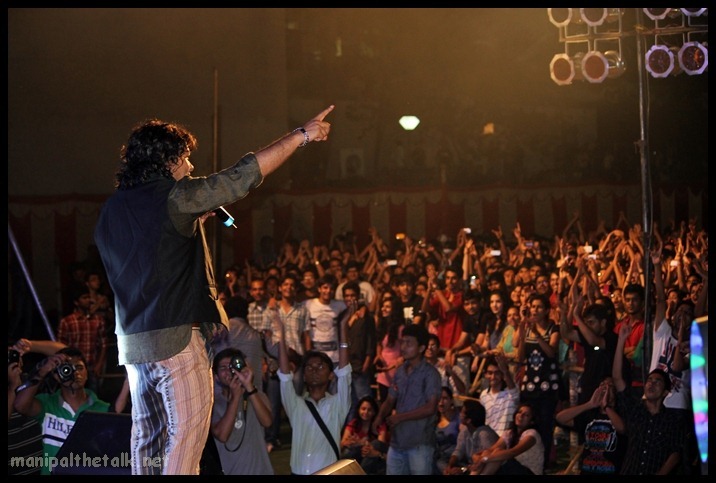 All in all, Kailasa Live in Concert in Manipal turned out to be a sublime experience which has already signaled the incoming of the biggest college fest of the year – Revels 2012! According to legend, Prometheus was the Greek Titan who stole fire from Zeus and gave it to mankind and was punished for the same. Thousands of years later, he has reincarnated, in an avatar of scorching embers and blinding radiance. Prometheus lives once more and his flare will consume the little town of Manipal. There will also be a whole bunch of informal events so keep an eye for those too! Prometheus will also host gaming in CS, NFS, etc. Want to prove your supremacy? Invoke your clans and get the mice rolling. Sounds cool? Eager to outsmart the rest? Are your fingers already itching to incinerate the keyboard? This was just the preview. Anyone with a passion for computers must take part in these events, as it will be a holistic learning experience. And of course, there are loads of cash prizes and certificates to be won! Come, and blaze away with Prometheus. 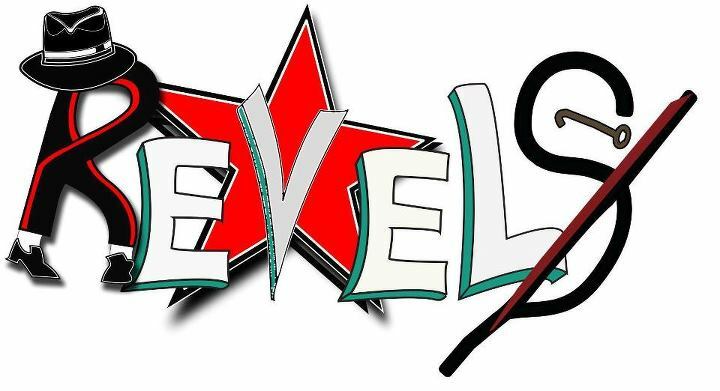 Revels 2012-the annual cultural and sports fest of MIT brings with it a promise, a promise to take collective step towards better world. With initiatives such as Green Run Marathon, Blood donation and Disha (informal activities with children from schools, orphanages etc. ), Revels 2012 has encompasses it all, their motto-WE the change. Who better to kick start this extravaganza than Kailash Kher? He is the true embodiment of will and determination and will mark the commencement of this festival on March 27th 7pm. The festival has a wide variety of cultural categories, namely Music, Dance, Fine Arts, Dramatics, Photography, Literary and Debate, XVenture, Gaming and EQ-IQ. The popular events like Fashion Show, Battle of Bands and War of DJ’s are sure to attract a lot of participation. Over 25 collages have registered to participate, including RV College of Engineering, NIT Suratkal, NIT Calicut, NITTE, Sastra, CBIT Hyderabad and Dayanandsagar Institute of Technology. Revels Cup-the Inter Collegiate Sports Meet is also witnessing a vast participation. Over 50 colleges and more than 1000 students throughout the country are expected to participate. The various events are Cricket, Athletics, Basketball, Chess, Football, Tennis, Table Tennis, Volleyball and Badminton. Ridiculous and baseless rules and regulations are nothing new to most of us. Yes, some rules are there to enforce discipline and order but the plain existence of some of them defies every aspect of logic. I went to the library’s main section today as I wanted to refer to some web development books. I take my laptop out and walk in. No sooner, I’m kicked out by the guy who sits at the table at the library entrance. 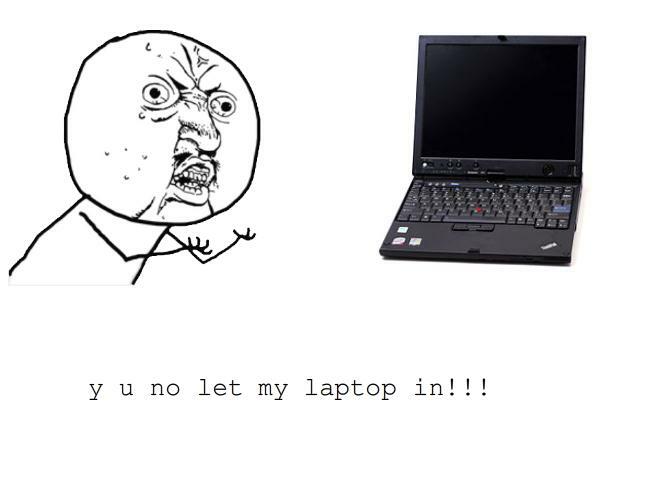 “Laptops allowed illla boss” was all he had to say. My requests for further explanation were turned down nonchalantly. One can understand the rationale behind banning bags in the library but banning laptops? Are the library authorities so paranoid that they think I’m going to type out eBooks of all their prized collections and outsource them for profits? Or perhaps they think I’m going to smuggle a book by squeezing it between the lid and the keyboard of the laptop? Or even worse, they think my laptop has a 10 Gigapixel spy camera that is being routed to the Al Qaeda! This is the qualm of a student who seeks reason for this denial. If a student has a passion to learn something and knows how he wants to go about it, there is no justification to reject his access to the appropriate resources. The age of the pen is all but gone and laptops are used to store notes and ideas. The library is meant to be a sanctuary of knowledge and I have every right to tap into it as I see fit. Encourage my endeavour rather than to blatantly throw me out. My laptop doesn’t bite nor is it a transformer that is going to transform into a Decepticon anytime in the near future. MIT students from all years were present. The 3rd years took the centre stage and guided the 1st and 2nd years. The issues under discussions were the resignation of the MIT Director and how student council can be made more efficient. It was decided that the SC should be dissolved and elections should be conducted to choose new members. At 3:50pm the students moved to MIT Quadrangle. Condolences were given before a jam-packed quadrangle (with students and professors) by the EEE department HOD, Registrar, Chief Warden, Director MIT and the Associate Director. EEE HOD (B.K Singh) was the first to give the condolences. There was a minute of silence soon after which all the official authorities left the place. The absence of the Director left the grieving students angry who wanted to discuss the matter out. No effect of speech or control by the Chief Warden and other faculty was useful. The Director returned in half an hour to announce that she can’t resign as it was the management’s decision and that compensation to the deceased would be looked into. Due to these decisions the angry mob moved towards the EDU to sort issues out. On the way a bunch of mischievous students broke a few NLH windows and panes which was uncalled for. 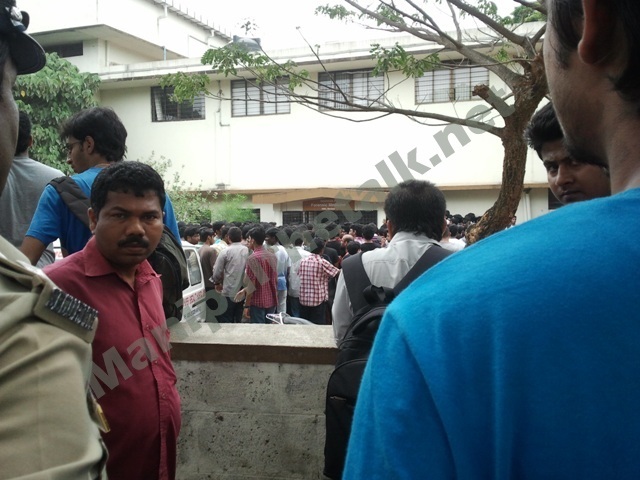 The angry mob moved to EDU where they were addressed by the Pro Vice Chancellor and the Registrar. They wanted a hard copy of the complaint and incident after which they would give a decision on the director. The students refused to do the same. Police was called in to control and scare the students away but that did not help either. Later a declaration of three days close down of college was made and the decision was postponed to Saturday to which students disagreed again. After much protest, agitation and revolt, the authorities finally gave in to take off the Director of MIT from her position and return to normal functioning of college from tomorrow (16th March 2012). In the first meeting on 10th March 2012, attended by the Chief Warden, Registrar of MU and the Director of MIT, it was informed that the student was recovering and is in a good state. Also, in a meeting with the transport authorities, it was decided that the frequency of buses will be increased from Monday (12th March, 2012). The second meeting which was held on 12th Match, 2012 was attended by the Vice-Chancellor of MU, Director of MIT and by the Associate and Joint Director of MIT and around 200-300 students at the Quadrangle of MIT. Here, it was informed that the university is taking the complete financial charge of the bus incident. 1. The number of buses should be increased- already in effect since today. 2. The speed of the buses to be curbed – already being told, meeting with bus drivers and conductors to take place for the same. 3. Proper timetable to be maintained for buses- a timetable will be formulated in the next 2 days and posted on all the hostel notice boards. 4. Door to remain close while the bus is in movement- will take time as few of the buses do not have door, the ones that do, will have this rules implemented instantly. As per today, (15th March 2012), there had been a Protest March in KMC and EDU which was curbed. There are two gathering- one at KC at 3pm and two at quadrangle at 4pm. For further details keep reading. 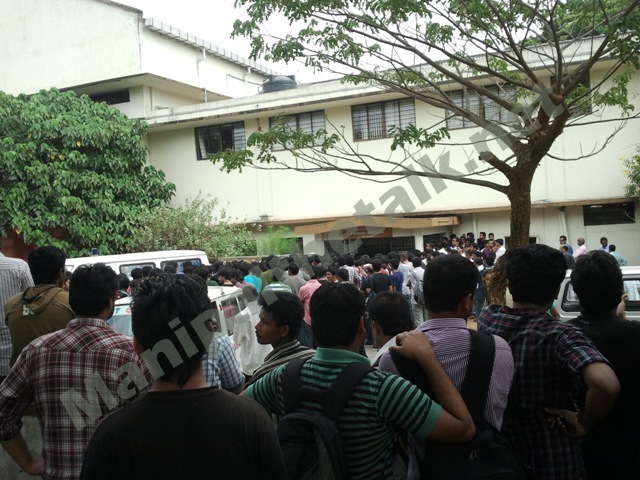 The Bus Incident furore finally ended as the Authorities of Manipal University took stage at Quadrangle at 5:30PM on Monday. The meeting was attended by a crowd of 300-400 people (considerably lesser than that on Saturday) and the dignitaries of the University namely The Vice-Chancellor MU, Director MIT, Associate Director and The Joint Director of MIT. 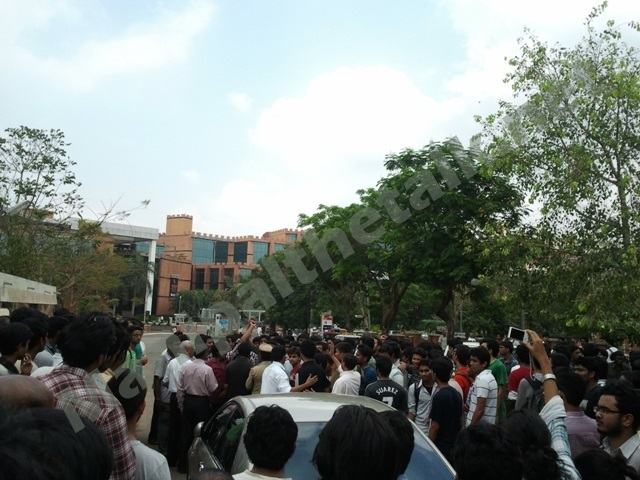 The Vice chancellor addressed the crowd by showing his support towards the students of the university. He also informed that all the medical charges for the treatment of the student shall be taken care by the university. He then gave an overview of the meeting held with the student representatives, earlier in the day. He also assured that the University shall always be in full support of the students and that further grievances can be reported by either E-mail (shall be declared later) or to the allotted faculty that shall be appointed exclusively for the same. This was followed by The Director and the Associate Director, who too assured that steps shall be taken against all the problems discussed. It is not every day that one gets to see MIT students debating on technical issues. Today was one such day when the final rounds of Tech Debate organized by ISTE took place in NLH 305, on 10th March 6pm onwards. Four participants had qualified for the 2nd round. A one on one debate was held between two participants at a time on the topic ‘Cloud Computing should be privatised’. The judges also put up questions to the participants checking their technical knowledge and presence of mind. One of the participants Dhruv Srivastava of first year said ‘It is a really nice initiative taken by ISTE where you have to speak technically and not any random stuff’. A volunteer of ISTE, Pooja also seconded the opinion saying that a good technical knowledge is needed by participants to make a stand in the competition. Two participants had a debate in the finals on the topic ‘Invasion of Technology in private space’. The first position was bagged by Arjun Jamil and the runner up was Anurakti. The winner got a cash prize of Rs 3000.